We've begun a study of the Good News Gospel of Grace. So far we've seen that this Gospel isn't a religion. The Gospel reveals this New Covenant is about a relationship. We've seen the reality of the New Creation. What it means to be a New Creation in Christ. Today, I sensed the impression to address an area that has been severely neglected when ministering the Gospel of Grace. 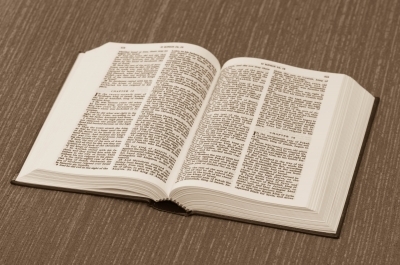 It seems in some gatherings that God's Word is of minimal value. It seems to have taken a receive it or dismiss it place in some people's lives. What must be brought back to the forefront is the truth that apart from God's Word we would have no knowledge of the New Covenant and what we have in Christ. God's Word is the eternal truth. It is a light to our path. It leads us and guides onto right paths, revealing the truth. Some have said it is not God the Father and God the Son and God the Holy Bible. I would agree with that in the sense that they meant it. Some tradition-bound believers believe God isn't speaking to or leading His children any longer since we have the Scripture. The key to keeping this truth centered is that any impressions or thoughts you have inwardly would never contradict Scripture. The Spirit authored the Scripture. Therefore, He would never contradict or dismiss Himself. What the Gospel doesn't do is dismiss God's Word. Anytime someone says the Word is wrong and their view or "revelation" is right, know that they are in serious error. God would never contradict His Word. Understanding this, let me expound of the purpose of the Gospel briefly. The Gospel is the proclamation of the Good News. It is the glad tidings of the Grace of God pledged and manifested in Jesus Christ, and His Finished Work. The purpose of the Gospel is to herald Good News so the lost can be found, turning from darkness to light. It's a celebration of redemption. The Gospel of Grace is not, however, designed to be some weapon of mass destruction. Yes, God in Christ, soundly defeated the enemy. His truth destroys the works of the enemy. Understand though, that the Gospel is not about tearing down portions of the Body of Christ. It isn't given to tear down "religion" or to be a tool to shock and irritate fellow Christians. Some have adopted a concept that Grace is designed to destroy and tear down people. what do I mean? Yes, religious tradition is highly mistaken in their teaching. Do you believe then that God wants to smite them? No, God wants to see their eyes open to the truth. We do a disservice when we say religion lied to me. To lie means that one knows the truth, and maliciously conceals that truth purposefully misleading others. Instead, just be sincere, religious tradition is mistaken and they spread mistaken ideas about God and His goodness. I wasn't lying when I used to teach we could lose our salvation. Why? Because I sincerely believed we could. I was mistaken. I didn't have a clear understanding of the truth of the Word. This is why we need to understand God's Word in light of the New Covenant. It isn't that the Bible is wrong, its that we haven't rightly divided it in light of the New. Truth is we all need each other. The whole Body of Christ. No Christian is our enemy. We are the Family of God. God wants all of His kids to understand the truth of Grace. Berating, belittling, being bitter towards others will not cause that to come to pass. The Word is truth. Religion may misunderstand it. However, the foolish one dismisses it or twists it to find a following. Or to find "favor" in the eyes of the World system. Jesus didn't find approval or acceptance in the World's eyes, so why do we so often seek their approval? Don't allow foolishness to guide your study and understanding of God's Word. All Scripture is for edification, exhortation, instruction, correction, wisdom and sound doctrine. His Word is the eternal, immutable Truth. God's Word never was, nor ever is or will be, some type of riddle or puzzle or code that we must decipher, ever searching to find some new hidden meaning that will concur with and conform to the sentiments of modern ages and secular cultures. Bible interpretation isn't about appeasing the masses, diluting truth to be more acceptable to the natural minded, or dismissing whatever "secular progressives" deem to objectionable. The truth is we can't win this World by appealing to their sinful nature. We can't win them by conforming to their darkness. We can't win them by finding new tenets of the faith to publicly deny. We win the lost, by revealing the light. By showing them the love of the Father. By revealing that He isn't mad at anyone and that He isn't holding their sins against them. The Good News Gospel is clearly revealed to us in God's Word. We need to realize the reality of the truth of God's Word. God's Word reveals and details all that belongs to us in Christ. God's Word is the promise of what we have in Christ. Faith is the title deed. Faith rests in what God promised. A title deed means even if I can't see it or feel it I know beyond a doubt I possess it. If you have the title deed of a house, it means you have a house whether anyone believes you or not. This is amazingly Good News when it comes to the Gospel. God's Word is our sure guarantee it is Finished. It's the Word that tells us we've been forgiven once for all time. It's the Word that tells us we've been made the righteousness of God in Christ. It's the Word that tells us we've been made accepted in the beloved. It's the Word that reveals we are eternally secure in Christ. It's the Word that reveals by His stripes we were healed. When we blow it and feel like we are out of fellowship, the Word reminds us, He will never leave or forsake us. When we sin and we feel like we are unworthy, The Word reminds us He made us worthy by the Blood of Christ. When we mess up so badly, the enemy comes with condemnation, the Word reminds us we are righteous and are under no condemnation in Christ no matter what it looks like or feels like. In summation, never lose sight of the importance and preeminent place of God's Word. It is the anchor in tough times. It reminds us of all Christ accomplished on our behalf. Faith comes by hearing God's Word. Whenever men, tradition, the World system, the enemy brings their error, their mistaken ideas, their accusations, their lies, we have a more sure Word that silences them all and is the final authority in all things. God's Word is invaluable in the life of the believer. It's God's love letter to humanity. It's His eternal truth revealed to mankind. His Word is non-negotiable, no devil, no tradition, no man can alter or deter it. His Word is love, light, and truth. Once again, clear and concise. Not just about the Gospel, but the Grace and patience we need for people taught in error by well meaning teachers who were taught in error. It is difficult for many to let go of these traditional interpretations, especially when they make sense to the human mind. It can be hard to be loving and patient with someone who becomes angry and spiritually superior as they question your motives and Biblical sense that goes against much of what they believe about God, Lord Jesus and our righteousness. Yet we must be patient and graceful. And God will supply all we need to represent Them correctly if we ask Him to. Yes excellent points made. Thank you for your comment. The Gospel of Grace: It's not a Religion! The Gospel of Grace: Effortless Christianity?